Bialys are small Polish rolls that have a chewy yeast crumb, similar to that of a bagel. Unlike bagels that are boiled after baking, bialys are slightly steamed during baking. 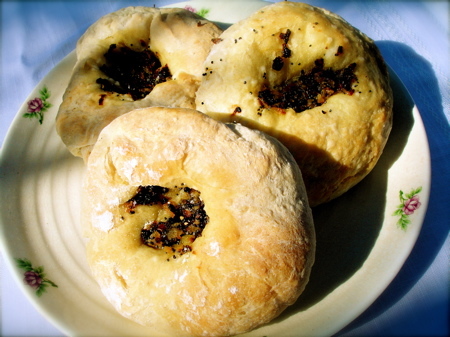 Bagels have holes in the center, and bialys have a depression that is filled with a combination of caramelized onions, poppy seeds, salt and pepper. I had a Bialy at a local Dean & Deluca several years ago and loved it. These little rolls seem like a delicacy in the Midwest but are actually as common as the bagel on the East coast. I had sort of forgotten about them until a few days ago when I was paging through a new summer cookbook I ordered. 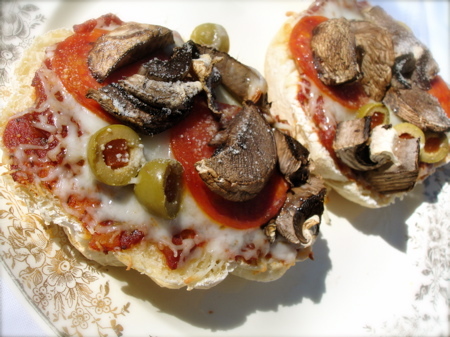 The author talked about her addiction to bialy pizzas! Because bialys aren’t easily found around Minnesota, I decided to bake a batch. They were actually pretty easy to make, but required 2 long proofing times…so, if you attempt this recipe just remember you’ll have to hang around the house to babysit them. Freeze whatever you aren’t going to eat within two days. Deflate dough by punching down. Transfer to floured surface and cut into 10 equal pieces. Gently pull each piece into a circle and then form a pouch by folding edges into the center of the circle. Pinch to close where edges meet. Set bialys on a large, lightly floured baking sheet (pinched sides down.) Lightly flour tops and cover with buttered plastic wrap. Set in a warm place and allow to rise for another 2 hours. While the dough is rising for the second time, make the filling and preheat the oven to 475 degrees F.
When the 2 hours is up, gently press depressions in the tops of each of the bialys. Put a little filling in the center of each. Place a jelly roll pan on the floor of the oven. Put a few handfuls of ice cubes on the pan. Place the baking sheet with the bialys on it on the middle rack of oven. Immediately shut door. Bake for 10 minutes, until pale-golden and mottled. ← My New Gladys Book! I love bialys when I had them as a child. This looks like a killer recipe! Thank you for sharing it. Hi Jenna! You’re welcome. Thanks so much for commenting. Enjoy! Ooo, ooo, ooh! I made bagels for the first time a couple of weeks ago, and my husband requested I try making bialys next. We must be on the same wave length. The bagels were perfect. I will never have to buy grocery store bagels again, thank god! I have been working my way through the book “healthy bread in 5 minutes a day”. That is where I got my recipe.